New information: IUCN received reports by the Canadian Parks and Wilderness Society - Northwest Territories Chapter (CPAWS-NWT), and confirmed by the State Party, that the Canadian Zinc Corporation has submitted land use applications to the MacKenzie Valley Land and Water Board, in order to support future production at the Prairie Creek mine site. The mine is located immediately upstream from Nahanni National Park, in the South Nahanni watershed, about 15km north of the World Heritage site boundary. Although the mine infrastructure has been in place since the early 1980s, the mine has never operated. The Canadian Zinc Corporation have applied for a land use permit to conduct a six or seven hole mineral exploration drilling programme, and re-establish an access road to remove a cache of diesel fuel stored 40 km from the mine site. Both the mine site and the Nahanni National Park are situated in the South Nahanni watershed, traditional territory of the Dene people of the Deh Cho First Nations (DCFN), and a proposed protected area. The Nahanni Butte Dene Band and the Deh Cho First Nations have expressed their wish to protect the entire South Nahanni watershed. The DCFN will be negotiating with the Government to withdraw the land in the watershed from further industrial development. In the autumn of 2000, supporters of Canadian Parks and Wilderness Society - Northwest Territories Chapter (CPAWS-NWT) submitted over 60 letters. As a result, the Canadian Zinc application was referred for an environmental assessment. There will be two separate assessments, one for the drilling programme, and one for the access road and fuel removal. CPAWS-NWT believes that the establishment of a major industrial development within the watershed and adjacent to the Park is not consistent with the conservation values of the area. They agree that the fuel cache, which has leaked an undetermined amount of fuel, should be removed from its present location. However, they argue that rather than re-establishing a 40-kilometre road as proposed by Canadian Zinc, alternative, environmentally responsible methods should be investigated for removing the fuel. The State Party has also informed IUCN that the company North American Tungsten Ltd. is assessing plans for re-opening the Cantung mine (a tungsten mine) in response to changes in the global tungsten market. This mine was closed in 1986 and is located on the Flat River, a tributary of the South Nahanni River, about 45 km upstream from the boundary of the World Heritage site. An additional 139 claims have recently been staked by the company. An all weather road has been reopened to the mine site. A major seismic exploration programme is also being developed and may be proposed for the South Nahanni watershed in the very near future. The State Party notes that these mining proposals are of concern to them and their mandate to protect ecological integrity. It will continue to monitor developments and make interventions to the Mackenzie Valley Land and Water Board. It also intends to seek a final boundary for the Park which has a better ability to maintain ecological integrity. This will be sought through the Deh Cho land claims process. The Bureau requests the State Party to submit a detailed report on the potential impacts these proposals may have on the World Heritage site by 15 September 2001. 2. Through the MVRMA process, focusing its reviews on the identification of potential impacts of the development proposals on ecological integrity and World Heritage values. It will work with proponents and regulatory agencies to develop appropriate mitigation measures, and if measures cannot be found, it will recommend further environmental review. V.153 IUCN received reports by the Canadian Parks and Wilderness Society - Northwest Territories Chapter (CPAWS-NWT), and confirmed by the State Party, that the Canadian Zinc Corporation has submitted land use applications to the MacKenzie Valley Land and Water Board, in order to support future production at the Prairie Creek mine site. The mine is located immediately upstream from Nahanni National Park, in the South Nahanni watershed, about 15km north of the World Heritage site boundary. Although the mine infrastructure has been in place since the early 1980s, the mine has never operated. The Canadian Zinc Corporation has applied for a land use permit to conduct a six or seven-hole mineral exploration drilling programme, and re-establish an access road to remove a cache of diesel fuel stored 40 km from the mine site. V.154 Both the mine site and the Nahanni National Park are situated in the South Nahanni watershed, traditional territory of the Dene People of the Deh Cho First Nations (DCFN), and a proposed protected area. 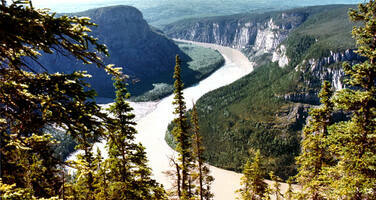 The Nahanni Butte Dene Band and the DCFN have expressed their wish to protect the entire South Nahanni watershed. The DCFN will be negotiating with the Government to withdraw the land in the watershed from further industrial development. In the autumn 2000, supporters of Canadian Parks and Wilderness Society - Northwest Territories Chapter (CPAWS-NWT) submitted over 60 letters. As a result, the Canadian Zinc application was referred for an environmental assessment. There will be two separate assessments, one for the drilling programme, and one for the access road and fuel removal. CPAWS-NWT believes that the establishment of a major industrial development within the watershed and adjacent to the Park is not consistent with the conservation values of the area. They agree that the fuel cache, which has leaked an undetermined amount of fuel, should be removed from its present location. However, they argue that rather than re-establishing a 40-kilometre road as proposed by Canadian Zinc, alternative, environmentally responsible methods should be investigated for removing the fuel. V.155 The State Party has also informed IUCN that the company North American Tungsten Ltd. is assessing plans for re-opening the Cantung mine (a tungsten mine) in response to changes in the global tungsten market. This mine was closed in 1986 and is located on the Flat River, a tributary of the South Nahanni River, about 45 km upstream from the boundary of the World Heritage site. A further 139 claims have recently been staked by the company. An all-weather road has been reopened to the mine site. A major seismic exploration programme is also being developed and may be proposed for the South Nahanni watershed in the very near future. The State Party notes that these mining proposals are of concern to them and with respect to its mandate to protect ecological integrity. It will continue to monitor developments and make interventions to the Mackenzie Valley Land and Water Board. It also intends to seek a final boundary for the Park that has a better ability to maintain ecological integrity. This will be sought through the Deh Cho land claims process. V.156 The Delegate of Canada informed the Bureau that five permit applications from the Canadian Zinc mine were received by the MacKenzie Valley Resource Management Board. One is specifically for up to an additional 60 drill sites and another relates to tailing ponds. Parks Canada referred the first two permit applications to second level environmental assessment, to the Environmental Impact Review Board. Parks Canada has also undertaken to create stronger relationships with other federal government departments and with the government of the Northern Territories. This has led to a broader support for the referral of the total permit applications to be assessed as a package and examination of cumulative impacts. It was noted that with other applications, open discussion with companies such as ARCIS has led to amendments to sensitive activities. The staff continues to work co-operatively with the DFCN and discussion has been initiated internally to move towards more permanent boundary definition. V.157 The Bureau requested the State Party to submit a detailed report on the potential impacts these proposals may have on the World Heritage site by 15 September 2001.